Along with green onions, garlic is one of the best health-friendly plants you can grow at home. It is super-easy and super-cheap. You may not like its taste and odor, but eating a whole garlic bulb a day works miracles for your body. Garlic is a simple food that has strong healing properties. Garlic is rich in nitrogenous substances, sodium, potassium, selenium, calcium, magnesium, silicon, sulfuric, phosphoric acid, vitamin C, D, B, phytosterols, extractives, and essential oils. It contains a phytoncide called allicin, formed during mechanical destruction of plants, meaning you should crush or grind your garlic to enjoy maximum benefits from this component. Researchers believe that allicin has strong bacteriostatic effect which cures infections quite faster. Garlic is packed with anti-fungal agents, which makes it much more powerful compared with many antibiotics in use today. Much of the garlic sold at grocery stores is treated with a hormone that prevents cloves from sprouting to prolong their shelf life. For best results, either use organic garlic or wait until you see the garlic begins to sprout on its own, often forming nubbins of roots at the same time. If you take a closer look, you might even see cloves sprouting at the store! Take a large pot and fill it with potting soil. Separate the cloves and put each clove vertically at a depth of 1 inch. Water the pot when it starts to dry out, same as you do with any indoor plant. Cut the greens when they are 3-4 inches tall, and leave an inch so they can regrow. At some point of time, the greens will stop growing. When they dry up and turn brown, dig out the cloves and each of them should have formed a full bulb. Take a clove from that bulb and start all over. In fall, plant cloves in well-drained beds after the first frost has passed and the soil is cool. Cloves can also be planted in late winter as soon as the soil thaws, but fall-planted garlic produces bigger, better bulbs. Garlic likes a lot of moisture, but will start to develop yellow leaves if they stay wet for too long. Since garlic loves cold weather, experimenters from zones 9-11 might be better off choosing another variety through mail order. On the bright side, you can also grow elephant garlic using the same instructions and it typically performs much better in warmer climates than its smaller cousin. Soft neck types grow best where winters are mild, though some tolerate cold to Zone 5. Most varieties do not produce scapes (edible curled flower stalks), but soft necks are great for braiding. Subtypes include Creole, artichoke and many Asian varieties. Hardneck types adapt to cold winter climates, and all produce delicious curled scapes in early summer. Popular subtypes include porcelain, purple stripe and rocambole varieties. Elephant garlic produces a large, mild-flavored bulb comprised of 4 to 6 big cloves. Closely related to leeks, elephant garlic is hardy to zone 5 if given deep winter mulch. 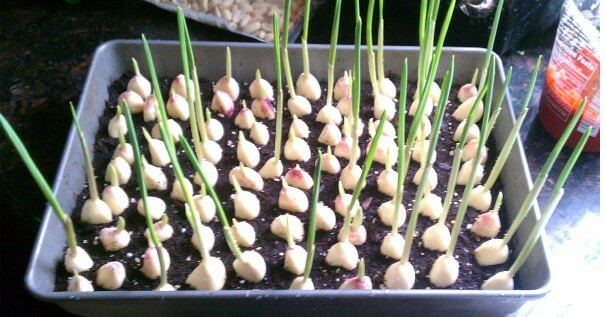 Fill your hands with freshly-harvested garlic right from your own window sill and enjoy good health!